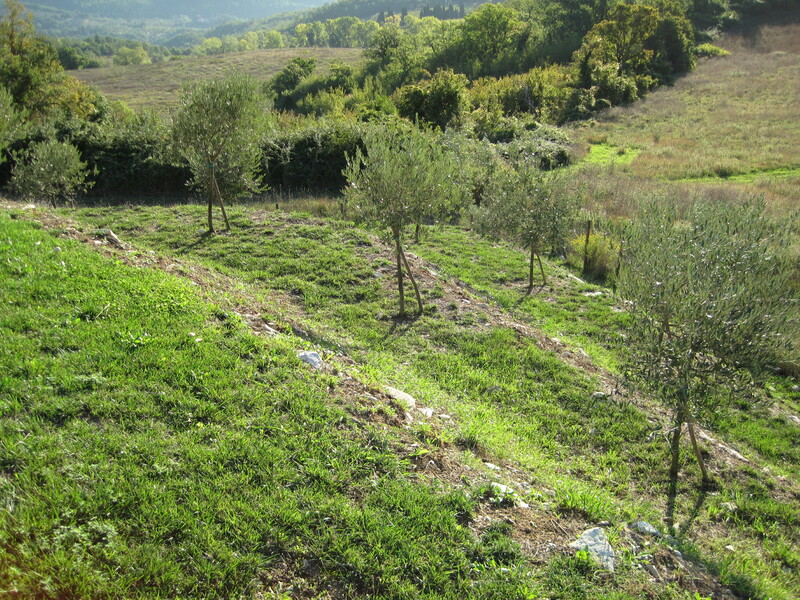 Italy in November with literally millions of olive trees, yet no one is picking the olives—and no one ever will! Instead, they will raccolgono, gather them, or prendono, take them. Just try to use the word “pick” on Italians and note the puzzled looks on their faces. They probably can’t imagine what you are even talking about. 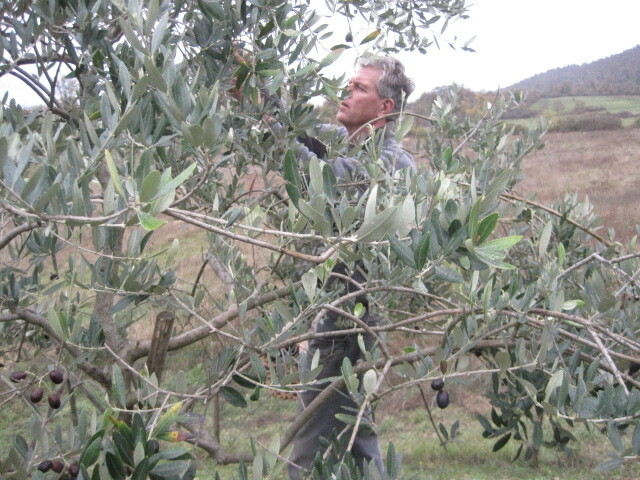 But, if you say gather or take at just the right time, not only would you be well understood, but might even find yourself up on a ladder in the middle of an olive grove for a few days. Somewhere between the middle of October to the middle of December, Tuscany becomes giddy about the impending arrival of the olio nuovo, new oil. 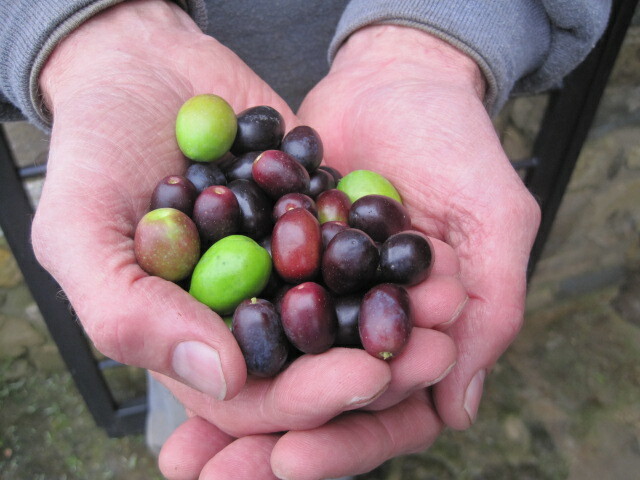 This year is a milestone for us because it’s the first time we will have picked (excuse me), I mean gathered the olives from our own trees! We planted 17 of those little alberi, trees on the terraces down the hill about 4 years ago. They were small at the time with trunks about the size of a rake handle and about that straight too. But we were patient and knew that in time, they would develop their own appropriate gnarliness and would bear lots of fruit. As you might have guessed, nothing much happened the first couple of years because they were plenty busy just trying to send some good roots down through the rocky soil. You know the old saying: the first year they sleep, the second they creep, and the third they LEAP! And that’s exactly how it played out. 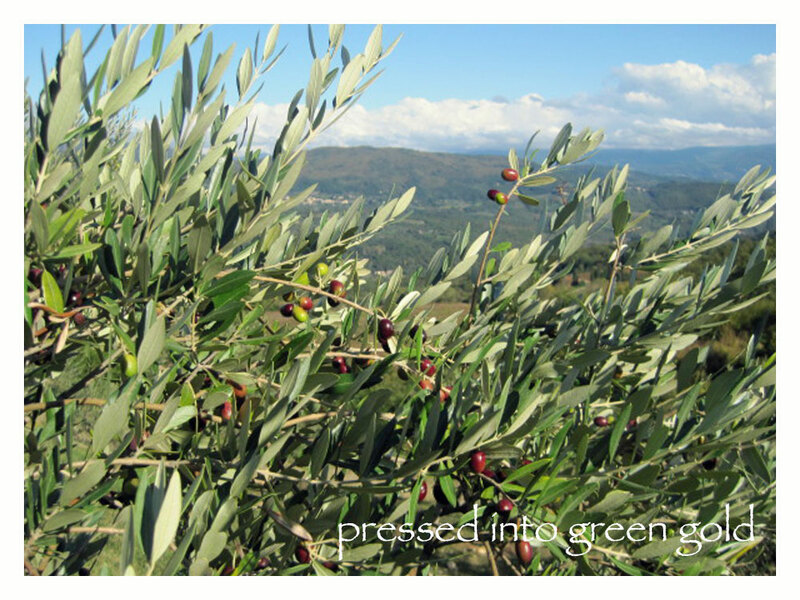 If you haven’t climbed up in an olive tree to gather those beautiful little gems by hand, it needs to go on your short list of things to do before you die. It’s one of those life-altering soulful experiences—imagine: filtered sun through the shimmering silver leaves while the fall breeze gently rustles by; the incredible olive colors ranging from bright green to deep purple and everything in between; the subtle pop when they release into your hand and then the unmistakable plunking sound like heavy rain when they fall into your basket; and the greatest thrill of all is feeling the weight increase until you can’t hold them anymore. At that moment, you give in and pour them into the large bins. They cascade like black golden nuggets—a sensory experience like no other. Last year, our friend Giacomo (who we’ve written about before) came by on his way to the frantoio, olive press where they squeeze the oil out. He gathered up what little crop we had to toss in with his truckload. We told him to help himself, since we didn’t want to waste them. When we tasted the final product, we were amazed. It was awesome! We decided the oil had picked up a little extra peppery flavor—surely from our small, but mighty contribution. So this year, we told Giacomo he could take the olives again as before, but he insisted that it was time for us to gather our own. He told us the date he had scheduled for his yearly trip to the frantoio and reminded us that we needed to deliver the harvest to him the day before. Simple? Not really. 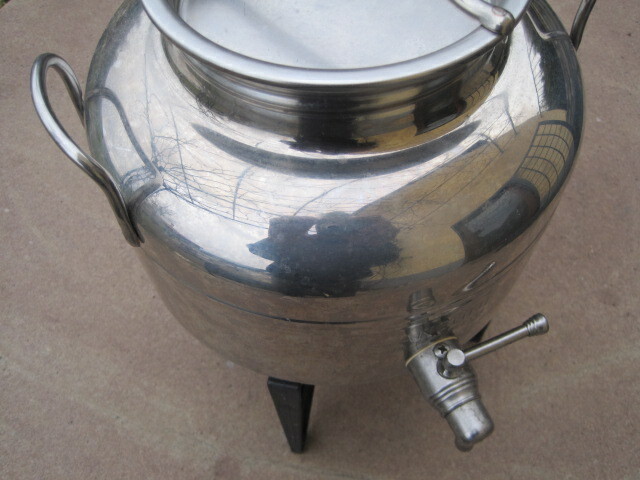 The implementation can get a little tricky, because the olives can’t sit around for more than two days before pressing them. This is problem number one: if they are slightly damp, they might develop a bit of mildew and then you could end up with a moldy mess on your hands. The second challenge is the weather. Obviously, since dampness is an issue, you’re not going to be monkeying around in those trees when it’s raining. And ohhhhh how it has rained this year! We waited as long as we could to honor the two-day limit and still have a fair shot at the weather. Sure enough, we found a morning that was threatening rain, but hadn’t yet, so we high-tailed it down the hill and started pluckin’ those suckers off the trees as fast as our little hands would go. It took the two of us a total of 4 hours with a yield of 22 chili, kilograms. To put that in perspective, you need a minimum of 300 chili (about 660 lbs.) to qualify for your own batch at the pressing room. And just for the record, Giacomo ended up with over 30 quintali which is 10 times the minimum—our hero! We clearly have a long way to go, but we figure that with our 17 trees and our neighbors’ 5, we can eventually produce our own Pretena olio, house oil. Of course, it will be the best in all of Tuscany . . . just like everybody else’s. We can picture it now: our trees have grown up to become healthy, well groomed, mature and appropriately gnarly; we refill our little 5 liter can in the house from the new 50 liter stainless steel drum in the cantina, where it stays, hovering at the perfect storage temperature for the entire year, awaiting our “olio-licious” desires (with plenty to share with friends); we are eating dinner by candlelight under the pergola, drizzling the golden-green oil over our favorite pasta, savoring the unbelievable taste—mellow and satisfied in being part of the centuries-old tradition. In the back of our minds, however, without admitting it, we will each be anticipating the upcoming fall season when the entire ritual will begin again just like clockwork. After all . 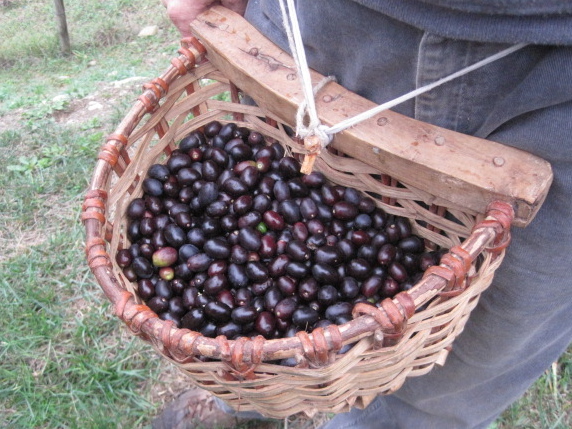 . . autumn in Tuscany is mostly about the new oil! Oh, yeah . . . and the wine.